Feedback do’s and don’ts – when’s the last time you’ve given or received feedback? When you’re in the position to give feedback are there rules of behavior you follow? How about when you receive feedback, do you have a preferred way it’s delivered to you? When you think about the word feedback, does it have a positive or negative connotation? The word feedback doesn’t have to mean criticism. Years ago when I wrote my first book, Six-Word Lessons On Influencing With Grace, one of my beta readers took issue with this. In her mind, feedback did mean being critical. She encouraged me to change the message on page 28. We ended up agreeing to respectfully disagree. Due to our instant-access society, giving and receiving feedback has become so much easier. At times it can be overwhelming the number of people who want to weigh in and offer their opinion on what you’re doing, saying, and being. With that in mind, here’s a few do’s and don’ts when giving feedback in order to keep the relationship intact and the rapport going. To bring the Do’s and Don’ts to life, please allow me to share a real-life example of some feedback I received recently. A few weeks back I selected a test group of people and sent them an introductory offer to a new program. The criteria used was to pull people who’ve consistently opened the weekly sales tips in the last few months who weren’t already current clients. The launch ended up being a success and there were quite a few people who responded to the email. Below are two of the responses, both offering feedback (initials are being used in place of names as the intention is to use these as examples, not recognize or call out any one person). 𝐄𝐱𝐚𝐦𝐩𝐥𝐞 𝟏:” Hi Nikki, Thank you so much for extending this opportunity to me. At this time I am not going to participate. L. W., another business coach has curriculum I have invested in. Your very talented and your verbiage is spot on! Wishing you tremendous success.” D.L. 𝐄𝐱𝐚𝐦𝐩𝐥𝐞 𝟐: “Hi Nikki, can I give you an honest piece of advise. Don’t start a letter that says “C. you have been on my mind” and have it be an eblast. That creates distrust and makes it hard for all of us trying to create authentic offerings online. I hope you take this to heart.” C.P. 𝐄𝐱𝐚𝐦𝐩𝐥𝐞 𝟐 (𝐚𝐝𝐝𝐢𝐭𝐢𝐨𝐧𝐚𝐥 𝐟𝐞𝐞𝐝𝐛𝐚𝐜𝐤): “Hi Nikki – I appreciate your response. It still feels off to me (I am a marketer for a zillion years), but that’s just me. Much success,” C.
𝐃𝐨: Let people know when they do something you appreciate. It’s a huge rapport builder and encourages certain behaviors. 𝐃𝐨𝐧’𝐭: Use phrases like, “Can I be honest” or “honest piece of advice”. Everything you say should be honest so don’t use this qualifier unless everything else you say is a lie. These phrases actually create doubt in the other person. 𝐃𝐨: Ask permission before offering someone feedback about something you don’t appreciate about them unless what they’re doing is directly impacting you in some negative way. Anything else is just you forcing your opinion onto someone who didn’t ask for it. 𝐃𝐨𝐧’𝐭: Speak for the masses or “all of us” unless you’ve been given specific permission by a particular group of people. 𝐃𝐨: Keep your feedback specific to your own experience. It’s much more credible when you talk from your own point of view. 𝐃𝐨𝐧’𝐭: Exaggerate or use terms that are throwaway lines (i.e. zillion years), they diminish your credibility and may come off as condescending. 𝐃𝐨: Unsubscribe and unfollow people who have a message that doesn’t resonate with you. 𝐃𝐨𝐧’𝐭: Imply that what someone else is doing has any impact on your own ability to be successful (i.e. makes it hard for all of us trying to ..), it’s a victim mentality and doesn’t serve you. 𝐃𝐨: Move on once you’ve given your feedback. 𝐃𝐨𝐧’𝐭: Try to convince someone to agree with you, it’s a waste of energy and effort and it’s not your job to force others to think like you. Keep in mind, everytime you feel the need to “give someone a piece of your mind” it has a ripple effect. The person you’ve put on “blast” knows people, has a voice, may take this as permission to do the same to someone else, may remember you and pass you over when they need what you offer, or a myriad of other responses you and I can’t even anticipate. Many of us grew up being told, “If you don’t have anything nice to say, don’t say anything at all.” Just because you have the ability to make your opinion known, doesn’t mean you should. 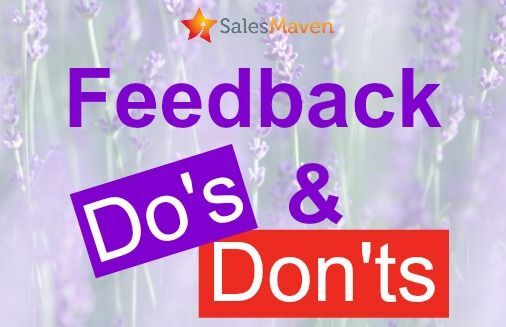 Before giving someone feedback, ask yourself, “What’s the intention of offering this feedback?” When the intention is to embarrass, shame or knock someone down, just don’t. When your intention is to help someone, lift them up or make them aware of something so they’ll have the opportunity to be/do better, then, by all means, reach out. Ask if they’re open to receiving feedback from you. Once you have their permission to give feedback, kindly offer some advice, suggestions, and examples of possible ways to improve.